You’ve probably heard of people saving money using smart thermostats. However, most of the hugely popular thermostats like Nest or ecobee are not for use in high voltage applications like under floor heat. Fortunately, there are some smart thermostats available for electric floor heat. They just don’t get the same amount of press as the bigger names. In this article, I’ll take a little time to explain what thermostats made specifically for electric floor heat can be used for and what they can’t be used for. Then, I’ll list a few of the models available for purchase in the US along with a brief description of how they might fit into your smart home. 1 Which Heaters Work With Wifi Floor Heating Thermostats? 2 Will Any Line Voltage Thermostat Work For Electric Floor Heat? 3 Should I Use The Floor Sensor Or The Air Sensor? 4 Will These Thermostats Work With My Smart Home? Which Heaters Work With Wifi Floor Heating Thermostats? These thermostats are designed to be used with electric resistance in-floor heat systems. Another type of in-floor heat uses a boiler and circulates a fluid as the heat source. Those heaters are called hydronic heaters. These thermostats will not work with them. 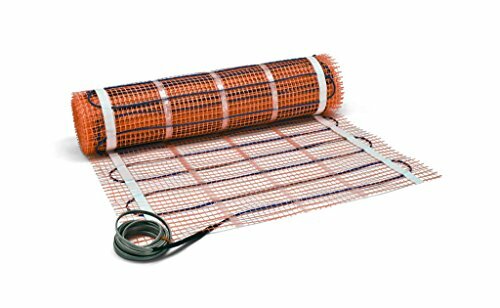 Each of the manufacturers of the thermostats I have listed also make their own heating mats. You might think that it would be beneficial to buy the same brand thermostat as your heating mat, but the truth is it’s not really necessary. It turns out, electric heaters are pretty simple devices. Therefore, you have the freedom to shop for whichever electric radiant floor heat thermostat you like regardless of your heater brand. The only restriction is that the heaters require 120/240v and no more than 15A. If you exceed the amperage, you will most likely fry the thermostat (that’s bad). You could also use these thermostats for any line voltage application. For example, electric baseboard heaters would work just fine. However, something that also requires fan control (like a wall convector) would not work. Will Any Line Voltage Thermostat Work For Electric Floor Heat? Do I really need a smart thermostat specifically designed for electric in floor heaters? Or, can I just get any line voltage smart thermostat? Well, it depends. 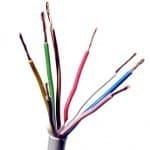 A thermostat made specifically for in floor heat will include the ability to connect a wired temperature sensor that reads the temperature of the floor. It will typically have both an ambient air temperature sensor and the in floor sensor. You have the option to choose which sensor to use to control your thermostat. If you don’t think you’ll use the in floor temperature sensor, there’s no reason you couldn’t just buy any smart line voltage thermostat. Should I Use The Floor Sensor Or The Air Sensor? 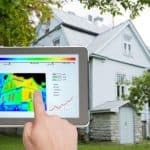 Whether you use your floor heat as your main source of heat or as a supplemental source of heat will likely determine which sensor you use (and whether or not you need the floor sensor). If you are using the floor heater as your main source of heat, it probably makes more sense to use the air temperature sensor. Since the heater will be turning on more often to keep the air warm, its unlikely that you’ll end up in a situation where the floor is too cold. For many installations, the purpose of the in floor heat will only be to warm the floor. A forced air furnace will be tasked with keeping the air warm. Since electrical heat is often the most expensive kind of heat, its usually best to use it as little as necessary. Therefore, in this case, it would probably be best to use the floor heat sensor. Will These Thermostats Work With My Smart Home? Standard smart thermostats (like Nest or ecobee) are much more integrated into today’s smart home. Since smart floor heater thermostats are a much smaller niche market, creating the software to integrate into the smart home is taking longer. 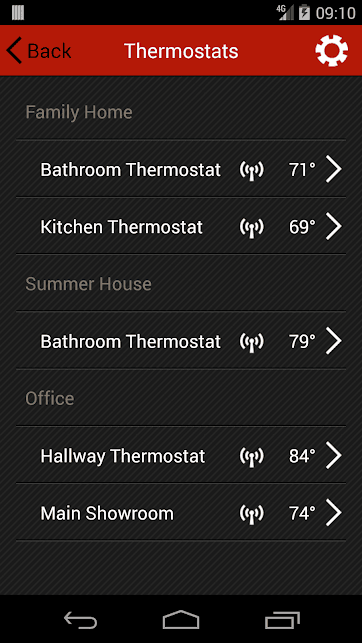 All of the thermostats come with their own smartphone app and all can be controlled remotely. However, there is limited ability to interact with the smart home. 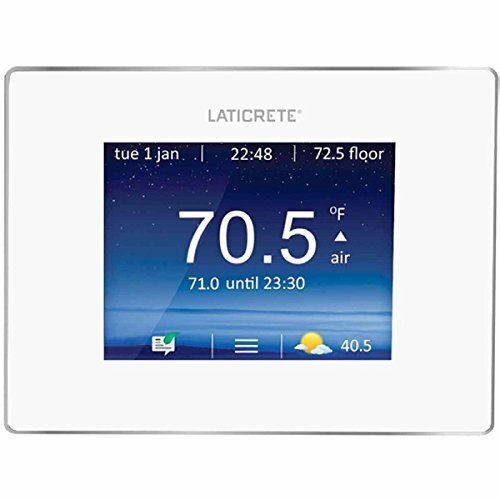 The Laticrete Strata thermostat is by far the most advanced in this area. It has the ability to connect to voice assistants and a few popular home automation hubs. It also has ability to use your mobile phone location to determine if you’re home or not. The NUHEAT has some integration with the Nest thermostat. However, in its current form the usefulness of the Nest integration is fairly limited. For me, the kiss of death for any “smart” device, is frequent disconnects and the unreliable behavior caused by them. No one wants a connected device that doesn’t stay connected. So, if it doesn’t stay connected 99.9% of the time, its probably more trouble than its worth. Whether its in the basement, a 4-season porch, or maybe a workshop, often times the location of a electrically heated floor will be a significant distance from your home’s main WiFi router. Of course, this immediately begs the question how good is the smart thermostat’s connectivity? Its a difficult question to answer because each person’s setup is different. Try putting a smartphone or tablet in the location the thermostat will be installed. Check to see how strong the signal is. 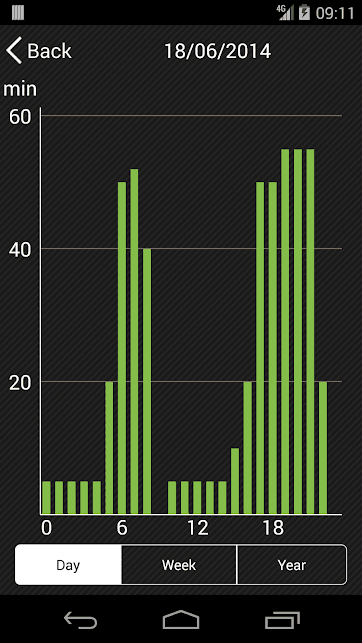 Ideally, you want to be getting a full signal. In my experience WiFi reception with smartphones seems to be a lot more reliable than WiFi reception with smart thermostats. Therefore, if you’re getting 3 or fewer bars with your smartphone, you may want to look into getting an extender. The Laticrete Strata Heat thermostat is Alexa compatible. Need I say more? I know, I know. Just about every product in the smart home world works with Alexa. However, for now its the only one of these smart floor heat thermostats that has it. So, its kind of a big deal, right? 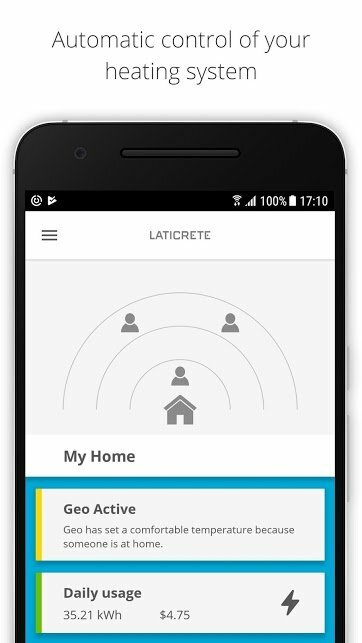 In fact, the Laticrete is by far the smartest smart thermostat of the bunch. It also has integrated geofencing. It can use the location of your smartphone to determine whether you’re home or not. The thermostat can then turn the heat on or off at optimal times which should help you save energy. It has a learn schedule option (much like the Nest Learning Thermostat) to go along with the geofencing. It records the times you come and go and over time begins to predict when you will be home and when you won’t. 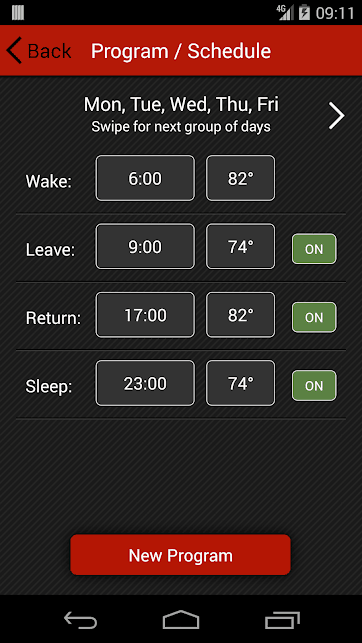 It even gives you the option to add a custom background to the thermostat screen. For sure, it’s not really necessary, but it lets you add a bit of your own style which is cool. Each thermostat listed here should perform its duties as a thermostat without any trouble. But, if all you want is a thermostat, why spend the extra money to get a WiFi thermostat? However, if you’re looking for features available with typical smart thermostats, the Laticrete Strata_Heat is the way to go. 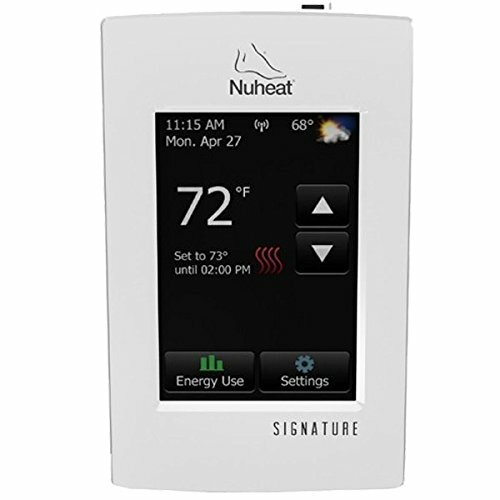 The Nuheat Signature thermostat has a large, clear screen with an easy to use programming interface. It displays current date, time, and weather conditions. 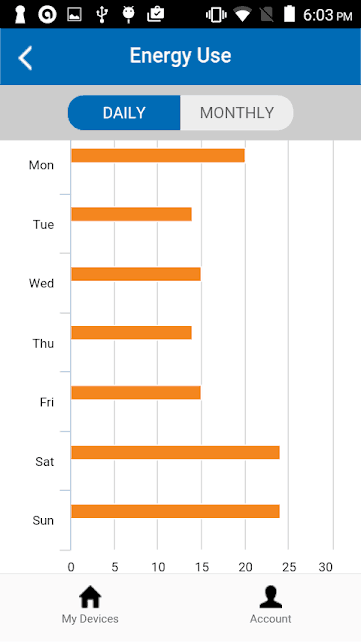 Plus, you can check your energy usage history on both the app and the thermostat. If simple is what you’re looking for, the Nuheat Signature will not disappoint. NUHEAT is the one electric floor heat thermostat that is directly integrated with the Nest thermostat. That’s right, it “Works With Nest”. Unfortunately, you can’t control the Nuheat directly from the Nest app. Instead, it just piggybacks on the Nest Home/Away Assist system. Simply put, if Nest senses that no one is home, Nuheat will stop heating the floors. This thermostat has been around for awhile and is quite popular, so you might think it’s a bit more advanced than other models. However, aside from its Works With Nest integration, there isn’t much that separates it from the competition. In fact, the Nuheat Signature app hasn’t even been updated since 2015. 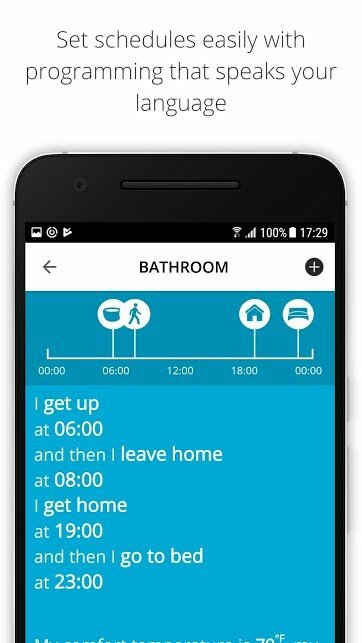 It would be great to see some integration with a voice assistant or common home automation hub. But for now, it doesn’t seem likely. 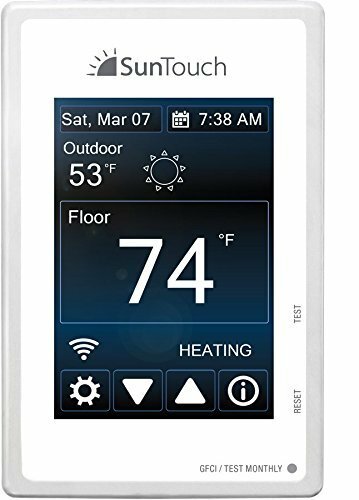 The SunTouch Connect WiFi Thermostat allows you to control your electric floor heating remotely any time anywhere. 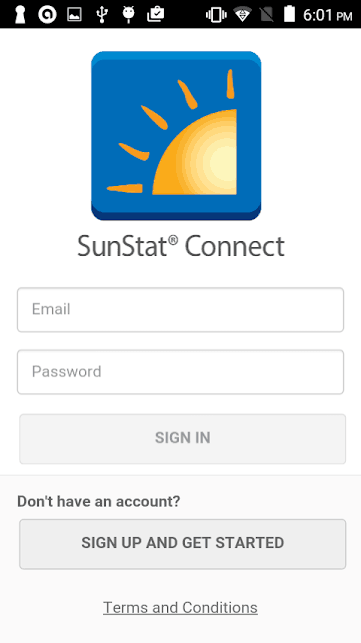 The SunStat Connect app allows you to connect and program multiple SunTouch thermostats from multiple locations. The programming interface is clean and simple. 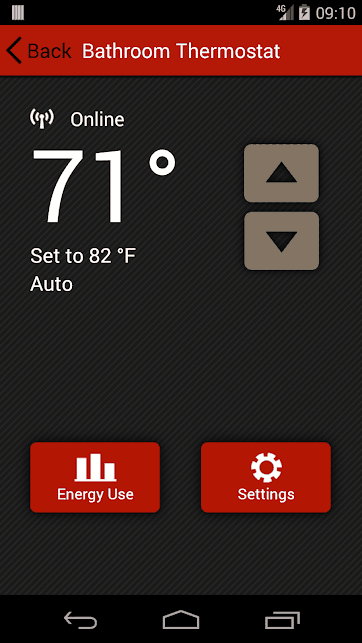 The app includes an “away mode” to turn off all thermostats at once. Unfortunately, away mode doesn’t work automatically like some smart thermostats. You’ll have to open the app and manually engage it. I suppose that’s still ten times easier than have to run around the house and reset each thermostat, right? The SunTouch displays local weather conditions and allows you to check the five-day forecast. It even tries to anticipate weather changes and adjust the floor heat accordingly. 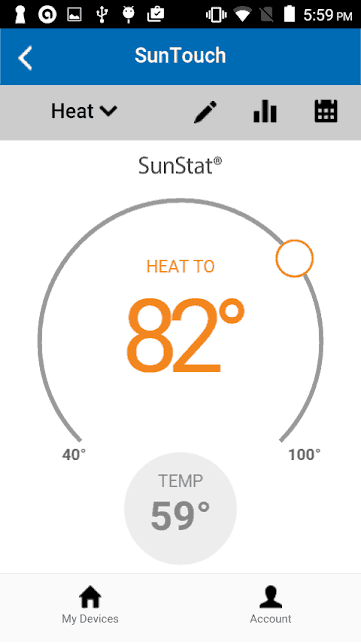 You can use the SunTouch to monitor your energy usage. It records usage data which can be viewed on either a daily or monthly timeframe. A minor annoyance I have with many line voltage thermostats is a noisy relay. When the heat turns on or off there will be an audible clicking noise. The SunTouch doesn’t suffer from this problem. The OJ Microline UWG4 offers all the standard features of a programmable thermostat with the added convenience of a mobile app. The interface is intuitive and easy to handle. 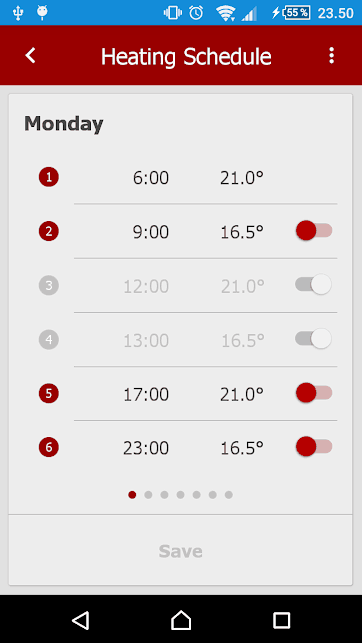 The heating schedule allows up to six change periods per day. It also allows you to easily turn individual change periods on or off as needed (see photo below). Even though it’s a WiFi thermostat, it doesn’t make any connections to outside smart home devices. It connects to its own companion app and that’s it. 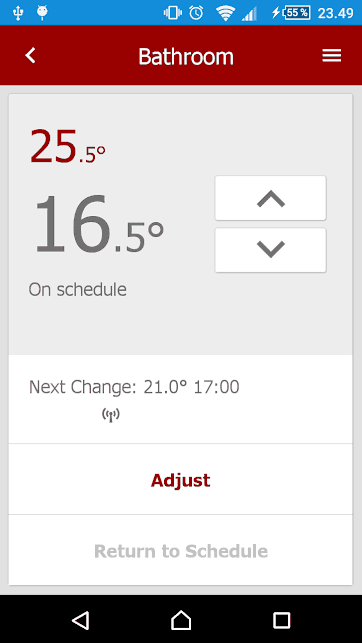 The app can be used to view and set temperatures, heating schedules, and vacations. 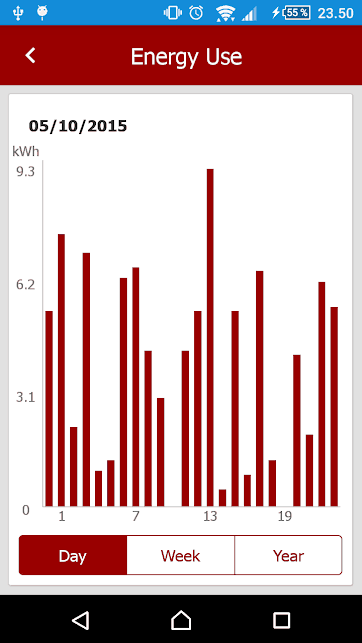 You can also view a log of energy usage. 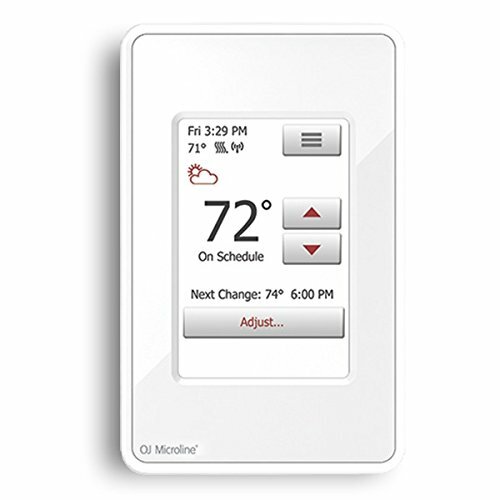 A unique feature of the OJ Microline thermostat is a fast-forward button. Press the fast forward button and the thermostat will skip ahead to the next scheduled change. 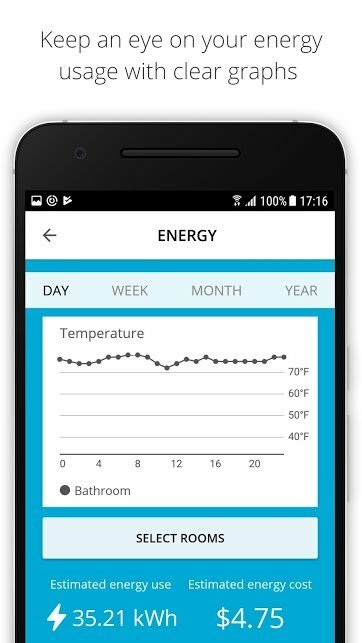 My research with this thermostat came across multiple user reports of poor performance from the app. There were several people who complained of sluggish response times and an inability to save changed schedules from the app. Unless you don’t think you’ll be using the app much, it might be a decent idea to look elsewhere or at least wait for a software update. Eric, THANK YOU for this article. I have been looking for the Holy Grail of radiant heat t-stats and you may be helping me find it. Basically my current device clicks madly, as you note, and it’s near my head at bedtime. So no more of that. The Nests of course (he said, after buying one) don’t work on this voltage. Reading your article, is the SunTouch the only one of these four units that doesn’t click?? Each of the thermostats listed in this article work using relays which means they will all make a clicking sound. However, they shouldn’t be nearly as loud as some of the older thermostats. That said, in a nearly silent room, even a soft click could be enough to annoy a person trying to sleep. To minimize any noise coming from the thermostat, you can 1. Make sure the screws are tight 2. Insulate around the electrical box that the thermostat is installed in using some spray foam.